” A-I-U-E-O Gabun” (“Gabun”, litteraly “pictures and sentences,” hereafter called ‘gabun’) is a photo and wordplay activity inspired by the tradition of Japanese word game forms. It is moreover a simple storytelling project consisting of photographs and sentences aimed to encouraging sustainable local communication and community building. Gabun has been continuously implemented though 2007 till 2012. First, gabun was developed as workshop primarily in 3 different locations across Japan; Shonan in Kanagawa prefecture, Toyohashi city in Aichi prefecture and Bunkyo-ward in Tokyo. 2011, gabun further expanded its breadth by working in collaboration with Tokyo Cable Network Inc., and Bunkyo-ward office. 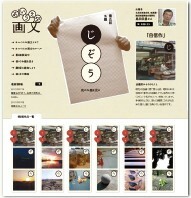 “Gakkan Engawa Workshop” is a media expression workshop utilizing citizen participation. The workshop was designed and held to celebrate the opening of Fukutake Hall at Hongo campus of the University of Tokyo in March 2008. With the completion of Fukutake Hall, we aspired to make it an open and connected space, much like the corridor balconies of Japanese traditional houses called ‘Engawa’ and thus we decided to name our workshop “Gakkan Engawa.” We invited participants to find a picture or photo image expressing ‘wa’ (‘circle’ in Japanese) followed by sending it to us with a short caption using either mobile phone or PC. 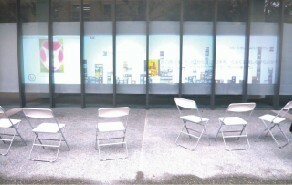 We processed these in real time and projected them onto large windows of Fukutake Hall. 2. Firework-type visualization: thumbnail images with the same keyword gather and made a popping-up motion much like a firework (Picture2). 3. Additional screen display: showing individual images in their original size with captions. Media Conte is a digital storytelling project, focusing on the people who are marginalized and tell their untold stories. With the storytelling movement found in the West, it is often said that “everyone has a story to tell,” and so in workshops conducted on the theme, participants appear to feel like they are expected to prepare stories in advance, just to fulfill this credo. However, in the case of Japan, many people don’t seem conscious of their own opinion or aware of the stories of their own life. In order to harvest the seeds of these untold stories, first, we focused on the role of university students as facilitators, editors, and/or co-creators. They are expected to cooperate with the participants by listening to their unvoiced voices, helping to generate stories and video production. 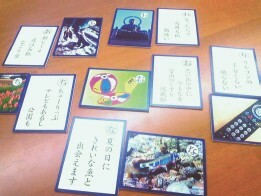 “Keitai Trail!” is a collaborative media practice, designed to collect, connect and visualize people’s stories through a game-like activity. We used “keitai (mobile phone in Japanese)” as a main activity tool, not only in order to invite people in their most familiar setting, but also to explore a new way of using mobile phones for media expression. We developed rules for their activity (figure1). Participant should fill in the blank space of question with his/her own word. Then give a free talk explaining the word. From the story, create a new question for the next participant. Storytelling activities were recorded with the mobile movie kit. Finnally, we created a connected network of people’s stories and visualized them in a collaborative expression map. As a collaborative program with Namkai broadcasting station in Ehime prefecture, we utilized the “keitai trail!” format in a media literacy workshop with teenagers in 2008. For more information of the program, please check the above website. Radique! (Radio Community Quest) is a ‘quest workshop’, where participants explore local towns with map and IC recorder in hand, recording their experiences, cutting and editing and finally sharing these local stories on community radio stations. Radique! workshops were held so far in local shopping districts of Kyoto and Kobe, joined by students from Yuko Tsuchiya lab at Hiroshima University of Economics and Akiko Ogawa lab at Aichi Shukutoku Univeristy. On August 9th-10th, 2010, the first workshop took place around Sanjyo-dori in Chukyo-ku, Kyoto city, with around 30 students participating. Students were asked to interview local shop owners about their “life philosophies”. These recordings were later edited out of which 30 minute long programs were made and broadcast on Kyoto Sanjyo Radio Café. “Toyama Photo Senryu” is a media literacy project conducted in collaboration with Tulip Television, a commercial broadcasting station in Toyama prefecture. 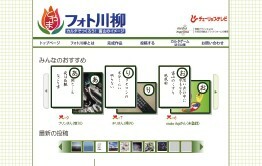 It was moreover a cross media activity using the TV program and an official website for both PC and mobile phone. Alongside this, several workshops were held in Toyama prefecture and Tokyo. In this project, we collected “photo senryu” (“Senryu” is a satirical poem consisting of 17 Japanese syllables) on the theme of “Images Toyama television never shows you”. By making the “photo senryu”, participants discovered the discrepancy between the image of Toyama broadcast by mainstream media and their own actual reality of everyday life. “Toyama Photo Senryu” allowed participants to create their own image of Toyama. この記事はaboutに投稿されました. このパーマリンクをブックマークする。 コメントは受け付けていませんが、次の URL へトラックバックを残せます: トラックバック URL.